Cave Creek Canyon is located on the east side of the Chiricahua Mountains of Southeastern Arizona. 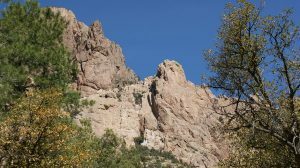 With the base of the Chiricahuas at about 3,600 feet (1,100 m), the range includes approximately 6,000 feet (1,800 m) of elevation change. Grasslands and desert cover the base of the range, with Ponderosa Pine, Douglas Fir, and Engelmann Spruce at the higher elevations. Wrapped around the perennially flowing Cave Creek (underground in late May and June), Cave Creek Canyon is considered by many to be the crown jewel of this magnificent mountain range. 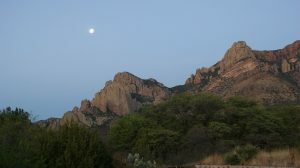 It is the largest and most biologically diverse canyon in the Chiricahua Mountains. It’s a favorite haunt of bird watchers and nature lovers, and is the home of the American Museum of Natural History’s Southwestern Research Station. The small community of Portal is at the mouth of the canyon, at the beginning of the spectacular rhyolite cliffs formed by ash and magma deposits from volcanic activity millions of years ago. With elevations ranging from 5,000 feet at the entrance to over 9,700 feet at the peak, the temperature in summer is generally 10 to 20 degrees cooler than Tucson or Phoenix. Winters are mild, but there is usually snow on the mountains. Fall color is spectacular. In spring and summer many rare Mexican birds come here to nest. Best birding months: late April and May migration; May and June Arizona breeders and owls; late July and August hummingbird migration. Winter for sparrows and hawks.